Protesters in Thailand demanded the resignation of the previous prime minister Yingluck Shinawatra had planned to re-nationalize Thailand’s vast wealth in natural gas, privatized and sold off under Yingluck’s brother, Thaksin Shinawatra in late 2001. As protests swell to historic sizes in the streets of Thailand’s capital of Bangkok, and in provinces around the country, pressure had built on toppling the government of Thaksin Shinawatra. While technically speaking, his sister, Yingluck Shinawatra, was prime minister, she literally ran with the campaign slogan, “Thaksin Thinks, Peua Thai does,” (Peua Thai being Thaksin’s political party). Image: 1000′s of protesters descend on Thai oil giant PTT’s headquarters in Bangkok this week – demanding it be re-nationalized after its privatization under Thaksin Shinawatra, part of a larger plan to sellout Thailand’s infrastructure and natural resources to foreign corporations – the same corporations backing Thaksin’s sister, Yingluck Shinawatra as she prepares for her brother’s return to power. It is no wonder then, why Yingluck has picked up right where her brother left off, eviscerating the nation’s checks and balances ahead of an even grander scheme – the privatization and sell-off of the entire nation to foreign investors through a series of free trade schemes. 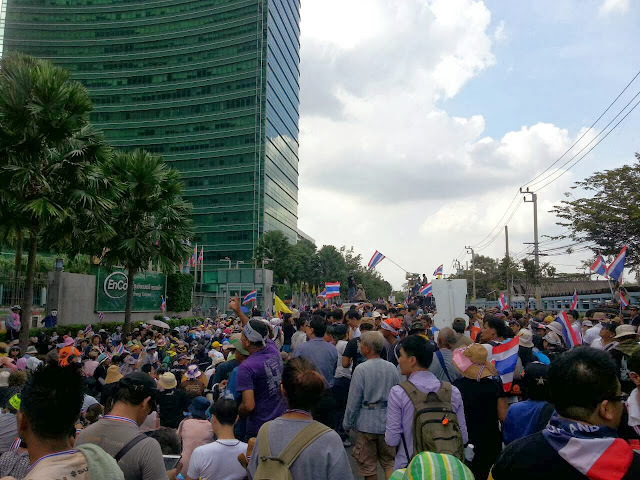 Meanwhile the Network of Students and People for Thailand Reform also switched from just protesting the amnesty bill to opposing the passage of the amendment of Article 190 of the Constitution which empowers the prime minister as a sole decision maker in making any treaties with foreign countries without seeking approval from Parliament. Thailand’s drive to privatize its plodding state enterprises is off to a fast start. The closely watched initial public offering of the state-owned Petroleum Authority of Thailand was oversubscribed by Thai and foreign investors, who collectively purchased 800 million shares in the company. Upon listing, the privatized company will be known as PTT PCL. Thai Prime Minister Thaksin Shinawatra has made the long-stalled privatization process a key economic objective. Over the next three years, the government is counting on the sale of stock in 16 state companies and agencies. Bangkok hopes the new listings will spur interest in the country’s drooping stock market by raising the Stock Exchange of Thailand’s market capitalization by almost 700 billion baht, a 50% jump from its present value. Thaksin Shinawatra, the telecommunications tycoon who became prime minister in February, has pledged to push privatization forward to reduce the government’s debt and budget deficit. But as share sales failed to materialize and antiforeign measures proliferated, foreign investors came to question Mr. Thaksin’s sincerity. Some said that Thailand, like Indonesia, was giving in to nationalism and vested interests that opposed selling stakes to foreigners at a discount. Last month, for example, the Thais enacted a law limiting foreign shareholdings in their telecommunications companies to 25 percent. So far this year, foreign investors have pulled 2.75 billion baht, or $61.9 million, out of the Thai stock market. This would not be the last attempt Thaksin would make at selling the country out to foreigners. In 2001, he lacked the impunity needed to ramrod deals through nationalist opposition, but by 2004 he felt more confident. Thaksin attempted to pass a US-Thailand Free-Trade Agreement (FTA) without parliamentary approval, backed by the US-ASEAN Business Council. While his attempt failed, he continued whittling away at Thailand’s checks and balances in the hopes of one day weakening the system enough to give himself and his foreign backers absolute impunity. But with his consolidation of power came an equal but opposite backlash. 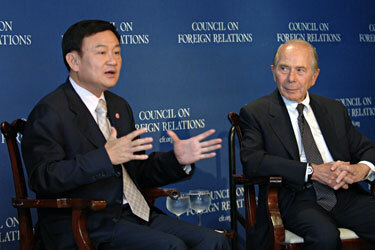 Thaksin would remain in office until September of 2006. On the eve of a bloodless military coup that ousted him from power, Thaksin was literally standing before the Fortune 500-funded Council on Foreign Relations giving a progress report in New York City. These lobbying firms are the secret to Thaksin’s political longevity, manipulating stories in the Western press to whitewash Thaksin’s many atrocities and crimes and lend support and legitimacy to his political machine as it maneuvers inside of Thailand to prepare the way for his return to power. Just before the 2011 general elections that saw Thaksin’s sister Yingluck Shinawatra brought into power, the US-ASEAN Business Council hosted the leaders of Thaksin’s “red shirt” “United Front for Democracy against Dictatorship” (UDD), proving that the dream of despoiling Thailand, not “democracy,” has been and remains the goal of Thaksin, his foreign backers, and the myriad of faux-NGOs that flank his political machine’s peripheries. Protesters, if they succeed in toppling Thaksin’s proxy regime, plan on rolling back Thaksin’s selling-out of its nationalized infrastructure, blocking free trade agreements his government is inevitably going to push through, rolling back self-serving amendments being made to the nation’s constitution, and defending against future incursions by foreign bankers under the guise of the IMF. Taking a stand against the corporate-financier interests represented by the US-ASEAN Business Council will make a protest movement very unpopular in the eyes of the Western media. Already the West is attempting to claim the protesters are unjustly trying to unseat an “elected government,” no matter how cartoonishly nepotist and corrupt it actually is. Also to undermine the protests, the Western media repeatedly fails to report on other grievances protesters have with the Shinawatra regime, including Thaksin’s 2003 “war on drugs” that saw nearly 3,000 mass murdered in just 90 days, most of whom had nothing to do with the drug trade at all, as well as his instigation of violence in Thailand’s deep south, culminating in the Tak Bai incident which saw 85 protesters killed in a single day. The US has condemned the seizing of government buildings by protesters in Thailand, while the pro-EU/Wall Street protesters in Ukraine are getting cash and encouragement to do the same against the government in Kyiv. As the protests expand, and with regime thugs now being sent to assault protesters, expect the already lopsided coverage by the West to tilt ever still in favor of defending Thaksin and the foreign agenda he represents.